Phil and Lisa are probably the BEST hosts you could ever expect. They went out of their way to make us comfortable. They MAKE Port Douglas what it is. OUTSTANDING COUPLE who made our vacation just shine!! Phil made everything about the stay super easy and smooth. The apartment was very comfortable and all of the little extra touches made it place we would return to. Plus location, location, location! Excellent stay! It was a beautiful relaxing apartment. We felt so comfortable the minute we checked in, it really was the perfect spot to relax and unwind. Location was great and Phil (owner) was so friendly and helpful. I wish we stayed a bit longer, I actually felt sad to leave. The apartment is in the most convenient location. It is close to beach and everything. It is very clean and comfortable. I am so appreciate that the owner Phil has taken care us so much. He tried many time until get in touch with me before my trip and advised me how to book the shuttle bus form the airport. When we arrived he drive me over the important places and showed me where best to go. Even this my first trip to port dogalas I felt I loved it because of Phil’s hospitality and the comfortable appartment. Definitely will go back! Central location. Nice touches of owners/hosts to 'meet and greet'. Lovely to have decent coffee and a full carton of milk and chilled bottled water in the fridge. The apartment was roomy with everything you could need! The location was convenient to all facilities. Apartment was comfortable,clean and spacious with a sunny balcony. Everything about the apartment was perfect except for internet/wifi. Excellent air con & ceiling fans. 5-6 minute walk to beach. No keys to worry about as door lock is coded and forwarded by host. Parking underneath apt building with easy access. All provisions are clean & modern. No elevator so you'll keep fit. Wonderful hosts Phil & Lisa will updated you by SMS about interesting and current events in the area so you won't miss a thing. Self catering apartment was ideal. Cleanliness was spot on. Easy access, on 1st floor. Normal size Fridge had cold drinking water in it. Bed was comfortable. Quiet end of Macrossan Street. 400 metres to 4 Mile Beach and probably the same distance to Coles supermarket. Lock in a great price for Port Douglas on Macrossan – rated 9.4 by recent guests! Located in Port Douglas with Marina Mirage and Crystalbrook Superyacht Marina nearby, Port Douglas on Macrossan has accommodations with a spa center. Complimentary WiFi is available. Units come with a seating area with a flat-screen TV, a kitchen with a dining area, and a private bathroom with a bath. A dishwasher and electric tea pot are also featured. 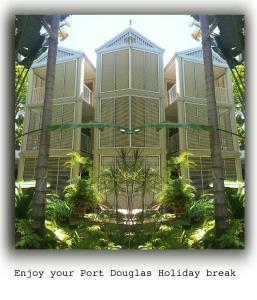 When would you like to stay at Port Douglas on Macrossan? This nautical contemporary apartment features a balcony with a day bed, a fully equipped kitchen, WiFi and is fully self contained. This apartment is located at: 108/63 Macrossan Street, Port Douglas. This Asian inspired contemporary apartment features a balcony, a fully equipped kitchen, WiFi and is fully self contained. This apartment is located at: 114/63 Macrossan Street, Port Douglas. Our self contained Boutique Holiday Apartments have been individually decorated by an Interior Design Stylist. If you are a couple or a solo traveller, consider our one bedroom self contained accommodation which is only a short stroll of about 100 steps from Four Mile Beach.We offer one bedroom self contained apartments located at 63 Macrossan Street, Port Douglas (cnr. Macrossan and Davidson Streets). Alternatively we offer two bedroom and three bedroom self contained holiday accommodation at the opposite end of Macrossan Street. Port Douglas on Macrossan THE PEOPLE, THE STORY Port Douglas on Macrossan has been created by 'lovers of coffee and holidays' partners Phil and Lisa whose dream was to share their holiday experiences of well located and stylish accommodation with travellers locally and abroad. Phil and Lisa are proud to offer holiday accommodation which as been designed to make you feel comfortable. Each of their apartments have been individually decorated by an interior design stylist and the results are outstanding. Port Douglas on Macrossan was born from the vision of a 'think-outside-the-expected' type of couple. Phil and Lisa offered their one-bedroom self-contained apartment in 2008 for others to share and enjoy. Now eight years on they still offer their apartment for travellers from all over the globe. All our holiday accommodation is situated on Macrossan Street, Port Douglas which is the main street of Port Douglas. Easy walking distance to shops, cafes, restaurants, Marina, Four Mile Beach, Sugar Wharf, St. Mary's by the Sea, Sunday Market, Dickson Inlet, Flagstaff Hill lookout, everything Port Douglas has to offer. House Rules Port Douglas on Macrossan takes special requests – add in the next step! Port Douglas on Macrossan accepts these cards and reserves the right to temporarily hold an amount prior to arrival. Please inform Port Douglas on Macrossan of your expected arrival time in advance. You can use the Special Requests box when booking, or contact the property directly using the contact details in your confirmation. Expensive rate per night for a very small bedsit type arrangement. Internet pictures made apartment look spacious and with own BBQ in a large balcony. Not being able to relax and have a cigarette on the balcony and the site being completely smoke free. Meant majority of time away from property in order to have cigarettes. Mouldy two seater on balcony. The bed was a little older - it moves (on rollers) and makes a bit of noise. Parking was available but there was no lift to the accommodation which was on the top floor so this was a little inconvenient. This fact was not known before booking and we didnt have any knowledge of the block of apartments. We could not find anything that needed improving.